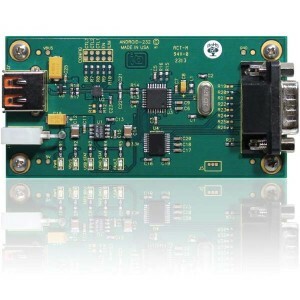 The ANDROID-232 is a USB serial interface board that enables you to control legacy RS-232 devices from your Android devices. 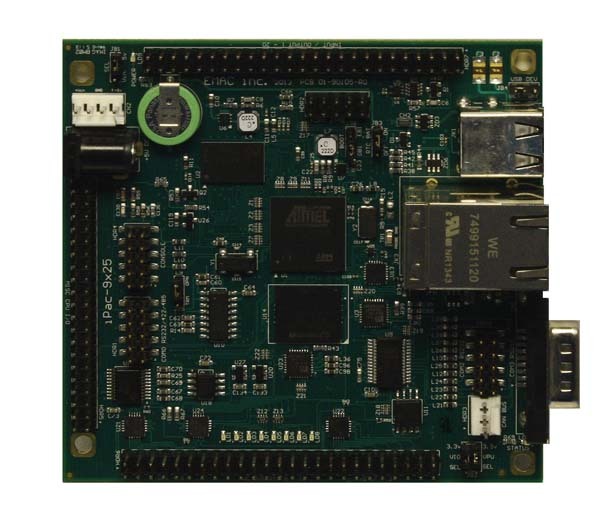 The board is well suited for POS, gaming systems, retail, hospitality, automation, kiosks, defense industries, lighting, or any other application requiring the connection of RS-232 serial devices to an Android-compatible system. The ANDROID-232 uses the Android Open Accessory protocol to “convince” an Android device that its on-board USB port (normally limited to USB slave or OTG modes) is actually an RS-232 port. This two-way data port enables external hardware to control the Android unit or the Android unit to control external hardware. 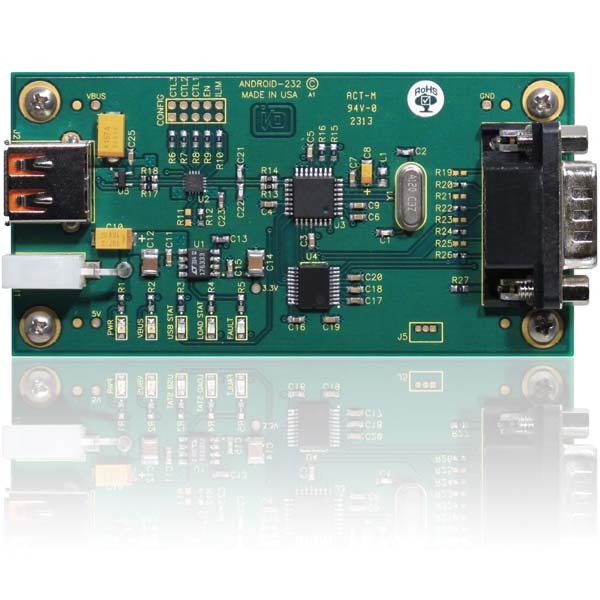 The ANDROID-232’s key features include an Android USB 2.0 full-speed host-to-industry-standard RS-232 DB9M serial port; support for a UART interface with RX, TX, RTS, and CTS; a 5,512-byte RX buffer size; a 256-byte TX buffer size; ±15-kV ESD protection on USB data lines and all RS-232 signals; status and fault LEDs including external power, charging status, and USB status; a Type-A USB connector; a latching 5-V external power input connector with an external regulated power supply; a –40°C-to-85°C standard industrial operating temperature; and RoHS compliance. The board includes an Android sample program with source code. This program enables you to verify proper operation of the ANDROID-232 device, including sending and receiving RS-232 data. The ANDROID-232’s Python test program can cooperate with the Android sample program to verify proper receipt of transmitted data. People want transistors—lots of them. It pretty much doesn’t matter what shape they’re in, how small they are, or how fast they operate. Simply said, the more the merrier. Diversity is also good. The more different the transistors, the more useful and interesting the product. And without any question, the cheaper the transistors, the better. So the issue is, how best to achieve as many diverse transistors at the lowest cost possible. One approach is more chips. Placing a lot of chips close together on a small board will produce a system with many transistors. Another way is more transistors per chip. Keep on scaling the technology to provide more transistors in one or a few chips. The third option combines these two approaches. Let’s have many chips with many transistors and end up with a huge number of transistors. However, there is a limit to this approach. It’s well understood that scaling is coming to an end. And placing multiple chips on a board can have a terrible effect on a system’s overall speed and power dissipation. But there is an elegant and intellectually simple solution. Rather than connecting these chips horizontally across a board, connect them vertically, providing N times more transistors, where N is the number of chips stacked one above another. Such vertical, 3-D integration was first broached by William Shockley, co-inventor of the transistor at Bell Labs in 1947. Shockley described the 3-D integration concept in a 1958 patent, which was followed by Merlin Smith and Emanuel Stern’s 1967 patent outlining how best to produce the holes between layers. We now call these inter-layer holes through silicon vias (TSVs). Technology is still catching up to these 3-D concepts. Three-dimensional integration offers exciting advantages. For example, the vertical distance between layers is much shorter than the horizontal dimensions across a chip. Three-dimensional circuits, therefore, operate faster and dissipate less power than their 2-D equivalent. A 3-D system is shockingly small, permitting it to fit much more conveniently into a tiny space. Think small portable electronics (e.g., credit cards). But the most exciting advantage of 3-D integration isn’t the small form factor, higher speed, or lower power; it’s the natural ability to support many disparate technologies and functions as one integrated, heterogeneous system. Even better, each chip layer can be optimized for a particular function and technology, since the individual chips can each be developed in isolation. No more trading off different capabilities to combine disparate technologies on the same chip. Now we can use the absolute best technology for each layer and a completely different and optimized technology for a different layer. This approach enables all kinds of novel applications that until now couldn’t have been conceived or would have been cost-prohibitive. Imagine placing a microprocessor plane below a MEMS-accelerometer plane below an analog plane (with ADCs) below a temperature sensor, all below a video imager (which has to be at the top to “see”). All of these planes fit together into a tiny (smaller than a fingernail) silicon cube while operating at higher speeds and dissipating lower power. There are technical issues, including: how to best make the TSVs, how to construct the system architecture to fully exploit the system’s 3-D nature, how to deliver power across these multiple planes, how to synchronize this system to best move data around the cube, how to manage system design complexity, and much more. Two issues rise to the top. The first is power dissipation (specifically, power density). When many transistors switch at a high rate within a tiny volume, the temperature rises, which can impair performance and reliability. I believe this issue, albeit difficult, is technically solvable and simply will require a lot of good engineering. The real problem is cost. How do we mature this technology quickly enough to drive the costs down to a point where volume commercial applications are possible? Many companies are close to producing tangible 3-D-based products. Cubes of highly dense memory will likely be the first serious and cost-effective product. Early versions are already available. Three-dimensional integration will soon be here in a serious way with what will be a fascinating assortment of all kinds of exciting new products. You won’t have to wait too long. In this final installment of my four-part mini-series about selecting an oscilloscope, I’ll look at triggering, waveform generators, and clock synchronization, and I’ll wrap up with a series summary. My previous posts have included Part 1, which discusses probes and physical characteristics of stand-alone vs. PC-based oscilloscopes; Part 2, which examines core specifications such as bandwidth, sample rate, and ADC resolution; and Part 3, which focuses on software. My posts are more a “collection of notes” based on my own research rather than a completely thorough guide. But I hope they are useful and cover some points you might not have otherwise considered before choosing an oscilloscope. Triggering your oscilloscope properly can make a huge difference in being able to capture useful waveforms. The most basic triggering method is just a “rising” or “falling” edge, which almost everyone is (or should be) familiar with. Whether you need a more advanced trigger method will depend greatly on your usage scenario and a bit on other details of your oscilloscope. If you have a very long buffer length or ability to rapid-fire record a number of waveforms, you might be able to live with a simple trigger since you can easily throw away data that isn’t what you are looking for. If your oscilloscope has a more limited buffer length, you’ll need to trigger on the exact moment of interest. Before I detail some of the other methods, I want to mention that you can sometimes use external instruments for triggering. For example, you might have a logic analyzer with an extremely advanced triggering mechanism. If that logic analyzer has a “trigger out,” you can trigger the oscilloscope from your logic analyzer. On to the trigger methods! There are a number of them related to finding “odd” pulses: for example, finding glitches shorter or wider than some length or finding a pulse that is lower than the regular height (called a “runt pulse”). By knowing your scope triggers and having a bit of creativity, you can perform some more advanced troubleshooting. For example, when troubleshooting an embedded microcontroller, you can have it toggle an I/O pin when a task runs. Using a trigger to detect a “pulse dropout,” you can trigger your oscilloscope when the system crashes—thus trying to see if the problem is a power supply glitch, for example. If you are dealing with digital systems, be on the lookout for triggers that can function on serial protocols. For example, the Rigol Technologies stand-alone units have this ability, although you’ll also need an add-on to decode the protocols! In fact, most of the serious stand-alone oscilloscopes seem to have this ability (e.g., those from Agilent, Tektronix, and Teledyne LeCroy); you may just need to pay extra to enable it. Most oscilloscopes also have an “external trigger input.” This external input doesn’t display on the screen but can be used for triggering. Specifically, this means your trigger channel doesn’t count against your “ADC channels.” So if you need the full sample rate on one channel but want to trigger on another, you can use the “ext in” as the trigger. Oscilloscopes that include this feature on the front panel make it slightly easier to use; otherwise, you’re reaching around behind the instrument to find the trigger input. This isn’t strictly an oscilloscope-related function, but since enough oscilloscopes include some sort of function generator it’s worth mentioning. This may be a standard “signal generator,” which can generate waveforms such as sine, square, triangle, etc. A more advanced feature, called an arbitrary waveform generator (AWG), enables you to generate any waveform you want. I previously had a (now very old) TiePie engineering HS801 that included an AWG function. The control software made it easy to generate sine, square, triangle, and a few other waveforms. But the only method of generating an arbitrary waveform was to load a file you created in another application, which meant I almost never used the “arbitrary” portion of the AWG. The lesson here is that if you are going to invest in an AWG, make sure the software is reasonable to use. 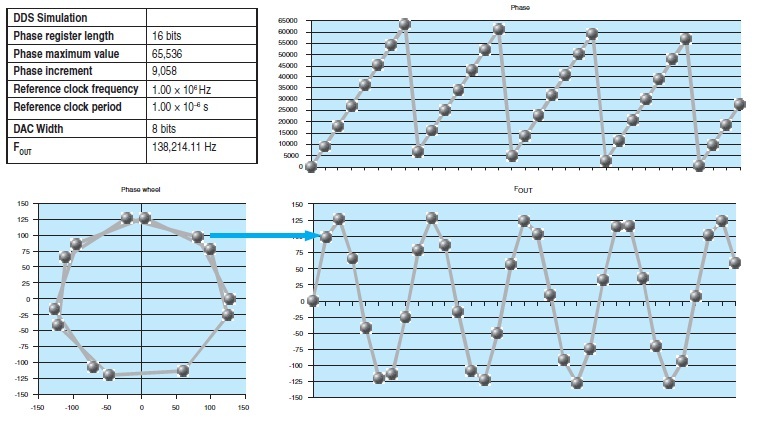 The AWG may have a few different specifications; look for the maximum analog bandwidth along with the sample rate. Be careful of outlandish claims: a 200 MS/s digital to analog converter (DAC) could hypothetically have a 100-MHz analog bandwidth, but the signal would be almost useless. You could only generate some sort of sine wave at that frequency, which would probably be full of harmonics. Even if you generated a lower-frequency sine wave (e.g., 10 MHz), it would likely contain a fair amount of harmonics since the DAC’s output filter has a roll-off at such a high frequency. Better systems will have a low-pass analog filter to reduce harmonics, with the DAC’s sample rate being several times higher than the output filter roll-off. The Pico Technology PicoScope 6403D oscilloscope I’m using can generate a 20-MHz signal but has a 200 MS/s sample rate on the DAC. Similarly, the TiePie engineering HS5-530 has a 30-MHz signal bandwidth, and similarly uses a 240 MS/s sample rate. A sample rate of around five to 10 times the analog bandwidth seems about standard. Having the AWG integrated into the oscilloscope opens up a few useful features. When implementing a serial protocol decoder, you may want to know what happens if the baud rate is slightly off from the expected rate. 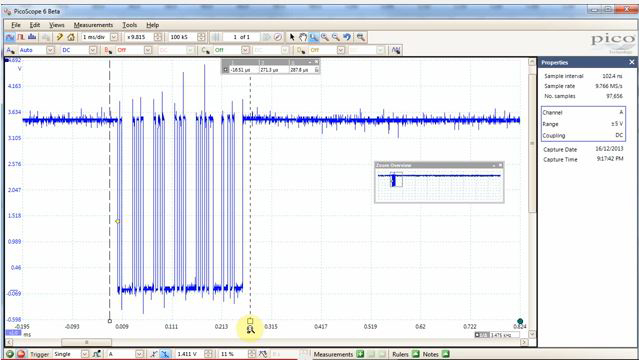 You can quickly perform this test by recording a serial data packet on the oscilloscope, copying it to the AWG, and adjusting the AWG sample rate to slightly raise or lower the baud rate. I illustrate this in the following video. One final issue of interest: In certain applications, you may need to synchronize the sample rate to an external device. Oscilloscopes will often have two features for doing this. One will output a clock from the oscilloscope, the other will allow you to feed an external clock into the oscilloscope. 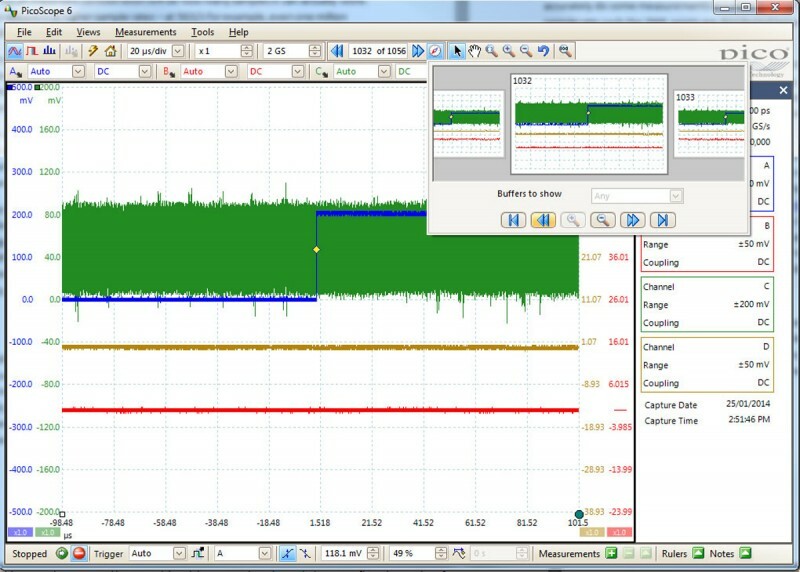 The obvious application is synchronizing a capture between multiple oscilloscopes. You can, however, use this for any application where you wish to use a synchronous capture methodology. For example, if you wish to use the oscilloscope as part of a software-defined radio (SDR), you may want to ensure the sampling happens synchronous to a recovered clock. The input frequency of this clock is typically 10 MHz, although some devices enable you to select between several allowed frequencies. If the source of this clock is anything besides another instrument, you may have to do some clock conditioning to convert it into one of the valid clock source ranges. That’s it! Over the past four weeks I’ve tried to raise a number of issues to consider when selecting an oscilloscope. As previously mentioned, the examples were often PicoScope-heavy simply because it is the oscilloscope I own. But all the topics have been relevant to any other oscilloscope you may have. You can check out my YouTube playlist dealing with oscilloscope selection and review. Some topics might suggest further questions to ask. I’ve probably overlooked a few issues, but I can’t cover every possible oscilloscope and option. When selecting a device, my final piece of advice is to download the user manual and study it carefully, especially for features you find most important. Although the datasheet may gloss over some details, the user manual will typically address the limitations you’ll run into, such as FFT length or the memory depths you can configure. 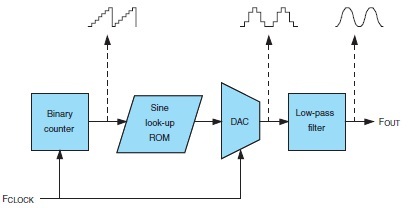 The simplest form of a digital waveform synthesizer is a table look-up generator (see Figure 1). Just program a period of the desired waveform in a digital memory (Why not an EPROM for old timers? ), connect a binary counter to the address lines of the memory, connect a DAC to the memory data lines, keep the memory in Read mode, clock the counter with a fixed-frequency oscillator FCLOCK, and voilà, you’ve got a waveform on the DAC output. Don’t forget to add a low-pass filter to clean the output signal, with, as you know, a cut-off frequency a little less than FCLOCK/2 to please Mr. Nyquist. 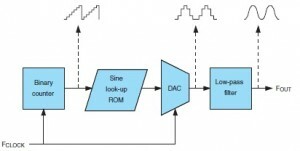 Figure 1: The most basic digital signal generator is built with a simple binary counter. Its output sequentially addresses the rows of a memory, which holds the successive points of the output signal. It is then converted to an analog signal and filtered. This design works, but it is not too flexible. If you want to change the output frequency, you need to change the clock frequency, which is not easy to do, especially if you need a fine resolution. The direct digital synthesizer (DDS) architecture is an improvement on this original design (see Figure 2). Rather than add one to the table look-up address counter at each clock pulse like the counter did in the previous example, a DDS uses an N-bit long-phase register and adds a fixed-phase increment (W) at each clock pulse to this register. Figure 2: The basic architecture of a DDS is a variant of the counter-based digital generator, but it allows a fine frequency resolution thanks to a phase register and a binary adder. The key point is that the increment is not necessarily a divider of the phase register maximum value. N can be quite high (e.g., 32 or 48 bits), so only the most significant bits of the phase register are used to select a value from the phase-to-amplitude look-up table, which is usually nothing more than a ROM preprogrammed with a sine waveform. Assume that you are using the P most significant bits as an address. Then the output of the lookup table is routed to a DAC. And, of course, the analog signal finally goes through a low-pass filter, which is called a “reconstruction filter.” You will understand why in a minute. Don’t be confused. It is not a simple programmable divider because the phase register doesn’t loop back to the same value after each generated period. The table in Figure 3 may help you understand it. Figure 3: This spreadsheet simulation shows the “phase wheel” concept. A fixed angle is added to the phase register at each clock pulse. Note that each period of the output signal is not identical to the previous ones because the phase doesn’t go back to the same value after a full turn. Not bad. In fact, the maximum frequency will be a little lower due to constraints on the low-pass filter.—Robert Lacoste, “Direct Digital Synthesis 101,” Circuit Cellar 217, 2008. The issue is available in the CC Webshop. 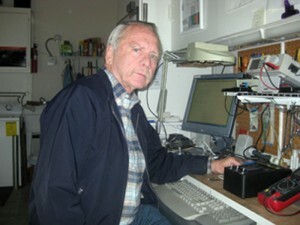 Jerry Brown, of Camarillo, CA, retired from the aerospace industry five years ago but continues to consult and work on numerous projects at home. For example, he plans to submit an article to Circuit Cellar about a Microchip Technology PIC-based computer display component (CDC) he designed and built for a traffic-monitoring system developed by a colleague. Jerry Brown sits at his workbench. 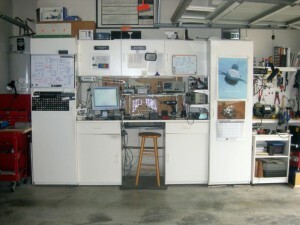 The black box atop the workbench is an embedded controller and part of his traffic monitoring system project. “The traffic monitoring system is composed of a beam emitter component (BEC), a beam sensor component (BSC), and the CDC, and is intended for unmanned use on city streets, boulevards, and roadways to monitor and record the accumulative count, direction of travel, speed, and time of day for vehicles that pass by a specific location during a set time period,” he says. Brown particularly enjoys working with PWM LED controllers. Circuit Cellar editors look forward to seeing his project article. In the meantime, he sent us the following description and pictures of the space where he conceives and executes his creative engineering ideas. I have a good supply of passive and active electronic components, which are catalogued and, along with other parts and supplies, are stored in the cabinets and shelves alongside and above the workbench. I use the computer to write and compile software programs and to program PIC flash microcontrollers. 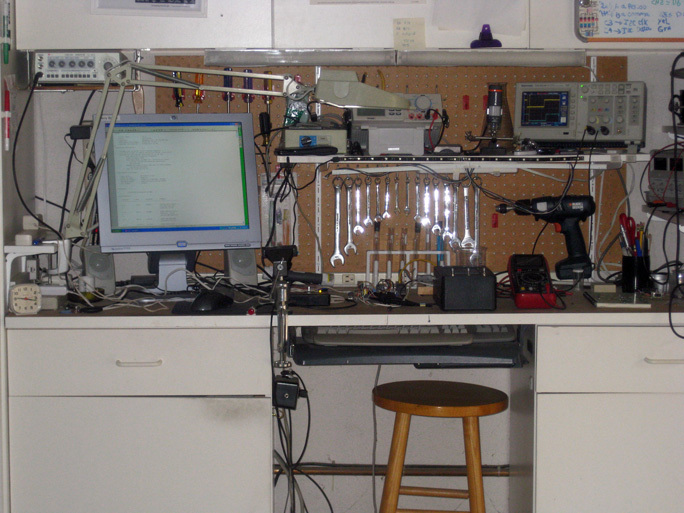 The photos show the workbench and some of the instrumentation I have in the lab, including a waveform generator, a digital storage oscilloscope, a digital multimeter, a couple of power supplies, and a soldering station. The black box visible on top of the workbench is an embedded controller and is part of the traffic monitoring system that I have been working on. Instruments in Brown’s lab include a waveform generator, a digital storage oscilloscope, a digital multimeter, a couple of power supplies, and a soldering station. Brown has a BS in Electrical Engineering and a BS in Business Administration from California Polytechnic State University in San Luis Obispo, CA. He worked in the aerospace industry for 30 years and retired as the Principal Engineer/Manager of a Los Angeles-area aerospace company’s electrical and software design group. DRU: I’m the lead tech writer for iXsystems, a hardware solutions provider and corporate sponsor of the FreeNAS and PC-BSD open-source projects. Since both of these projects publish a comprehensive user’s guide with each software release, most of my time is spent making sure each guide is kept up to date as changes are made to these OSes. I’m also involved in the FreeBSD Documentation Project and I am currently assisting in updating and preparing the FreeBSD Handbook for publication in a two-volume format. 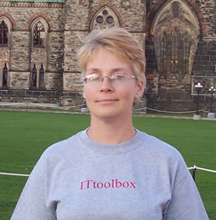 NAN: What is the FreeBSD Foundation? DRU: The FreeBSD Foundation is a 501.c3 nonprofit that provides financial support and a legal entity for the FreeBSD Project. The FreeBSD Foundation provides grants so developers can attend conferences and developer summits, sponsors developers to work on specific software projects that would benefit the FreeBSD community, interacts with companies that use FreeBSD to determine their needs, and assists in introducing developers to the community. As a director, I assist in fundraising and advocacy, reviewing project proposals, and developing relationships. NAN: What is BSD? What is the difference between BSD and Linux? DRU: BSD is a UNIX-like OS that was originally developed at the University of California Berkeley in the 1970s. When the university stopped developing the OS, several open-source projects began to continue development. Its lineage differs from Linux as Linux is derived from a different UNIX branch known as SysV. Traditionally, the most noticeable difference is that SysV systems use run levels whereas BSD systems do not. The release engineering process also differs between BSD and Linux. BSD projects release an entire OS with a set of base tools included in the OS’s userland. The entire OS has a release engineering team that is responsible for the release and a security team that is responsible for security advisories until a release reaches its end-of-life (EOL). In contrast, Linux itself is only the kernel. Each distro integrates that kernel into its installer, package management system, and userland to create a complete OS. NAN: How long have you been using BSD? When and how did you become interested? DRU: I started using FreeBSD in 1997. I went “cold turkey” by installing it on my only computer and learned how to do what I needed to do as I needed to do it. Once I was comfortable with FreeBSD, I ventured into learning how to use NetBSD and OpenBSD, and when PC-BSD came along, I switched to that as my main desktop system. NAN: Describe your involvement with the BSD Certification Group. DRU: I founded the BSD Certification Group to create a community-based and psychometrically valid certification exam for system administrators of BSD OSes. The group is composed of volunteers who have been involved in BSD for quite some time as educators, authors, and/or system administrators. We have worked hard to provide a globally affordable examination that provides real value to employers. NAN: You’ve written several books, including BSD Hacks, The Best of FreeBSD Basics and The Definitive Guide to PC-BSD. What can readers expect to learn from the books? DRU: How to be comfortable on a UNIX system and how to think using the logic of a UNIX system. NAN: Do you consider your books introductory or are they written for more experienced engineers? DRU: These books are written in the style: “Now that you have BSD, did you know that you can do these cool things?” I’m a hands-on person and I like to know what I can do and to understand what I’m seeing when something I do acts differently than I expected it to. The great thing about UNIX is that you can learn how to do something useful now, even if you have never seen a UNIX command line before. And, even if you’ve been around forever, there is always something you haven’t come across before or a cool new way to do something that you haven’t thought of before. So, these books can appeal to both the introductory user (the main target audience) as well as the advanced user (who will still pick up a trick or two before passing the book along to an introductory user). NAN: Are you currently working on or planning any books or projects? DRU: I do have a to-do list, book-wise. It’s interesting that I currently write the equivalent of three 300ish page books per year, but these are available for free online at doc.freenas.org and wiki.pcbsd.org. In addition, my current big project is the two-volume set for the FreeBSD Handbook, which will be a good 900 pages when it is complete. Once that project is finished, next in line is modernizing The Best of FreeBSD Basics for FreeBSD 10.x. Then, I’d like to write a second BSD Hacks-type book. NAN: What do you consider to be the “next big thing” in the industry? DRU: Since my expertise is in BSD, I’ll frame my answer from that perspective. The first is creating usable frameworks for securing/sandboxing existing non-secure applications. FreeBSD is leading the development and research in this area in its Capsicum framework (see the article “Capsicum: Practical Capabilities for UNIX” on the University of Cambridge website). The second is modern file systems that aren’t limited by the hardware restrictions that were around when most file systems were created. Examples include the OpenZFS storage platform and DragonFly BSD’s HAMMER file system. NAN: Give us some background information. Where are you located? Where and what did you study? DRU: I’m a recent transplant to Northwest Arkansas, having lived in Canada for many years. I went back to school in my early 30s to get a technical diploma in Networking and Telecommunications. I also earned the following certifications: MCSE, CNE, CCNA, CCSA, Security+, and probably others, which I have since forgotten. NAN: How did you become interested in OSes and IT? DRU: I was working in a dead-end position for a municipal department (low pay, very low glass ceiling) and wanted to expand my horizons. Many of our clients were being referred to a technical college for a networking program at a time when networking was a “hot” topic. I had no idea what networking was, but figured it couldn’t be any worse than what I was doing, so I negotiated half days with my employer so I could attend classes. I quickly found that the course interested me and I seemed to be good at it. Toward the end of the program, when I was researching employment opportunities, I noticed that the interesting and well-paying positions wanted UNIX experience. Having no idea what that was, and having no money as a poor student, I did an Internet search for “free UNIX.” The first hit was freebsd.org. I went to the website and my gut told me “this is it.” The rest, as they say, is history. Growing up in the 1970s, the first robot I remember was Rosie from The Jetsons. In the 1980s, I discovered Transformers, which were touted as “robots in disguise,” I imitated Michael Jackson’s version of “the robot,” and (unbeknownst to me) the Arthrobot surgical robot was first developed. This was years before Honda debuted ASIMO, the first humanoid robot, in 2004. “In the 1970s, microprocessors gave me hope that real robots would eventually become part of our future,” RobotBASIC codeveloper John Blankenship told me in a 2013 interview. It appears that the “future” may already be here. Welcome to the 21st century. Technology is becoming “smarter,“ as evidenced at the Consumer Electronics Show (CES) 2014, which took place in January. The show unveiled a variety of smartphone-controlled robots and drones as well as wireless tracking devices. Circuit Cellar’s columnists and contributors have been busy with their own developments. Steve Lubbers wondered if robots could be programmed to influence each other’s behavior. 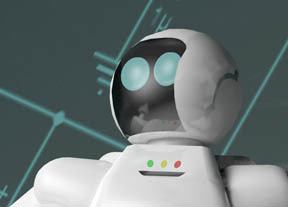 He used Texas Instruments’s LaunchPad hardware and a low-cost radio link to build a group of robots to test his theory. The results are on p. 18. RobotBASIC’s Blankenship wanted to program robots more quickly. His article explains how he uses robot simulation to decrease development time (p. 30). The Internet of Things (IoT), which relies on embedded technology for communication, is also making advancements. According to information technology research and advisory company Gartner, by 2020, there will be close to 26 billion devices on the IoT. With the IoT, nothing is out of the realm of a designer’s imagination. For instance, if you’re not at home, you can use IoT-based platforms (such as the one columnist Jeff Bachiochi writes about on p. 58) to preheat your oven or turn off your sprinklers when it starts to rain. Meanwhile, I will program my crockpot and try to explain to my 8-year-old how I survived childhood without the Internet. The iPAC-9X25 embedded SBC is based on Atmel’s AT91SAM9X25 microprocessor. It is well suited for industrial temperature embedded data acquisition and control applications. This web-enabled microcontroller can run an embedded server and display the current monitored or logged data. The web connection is available via two 10/100 Base-T Ethernet ports or 802.11 Wi-Fi networking. The iPAC-9X25’s connectors are brought out as headers on a board. The SBC has a –40°C to 85°C industrial temperature range and utilizes 4 GB of eMMC flash, 16 MB of serial data flash (for boot), and 128 MB of DDR RAM. Its 3.77“ × 3.54“ footprint is the same as a standard PC/104 module. The iPAC 9X25 features one RS-232 serial port with full handshake (RTS/CTS/DTR/DSR/RI), two RS-232 serial ports (TX and RX only), one RS-232/-422/-485 serial port with RTS/CTS handshake, two USB 2.0 host ports, and one USB device port. The board has seven channels of 12-bit audio/digital (0 to 3.3 V) and an internal real-time clock/calendar with battery backup. It also includes 21 GPIO (3.3-V) lines on header, eight high-drive open-collector dedicated digital output lines with configurable voltage tolerance, 16 GPIO (3.3 V) on header, two PWM I/O lines, five synchronous serial I/O lines (I2S), five SPI lines (two SPI CS), I2C bus, CAN bus, a microSD socket, external Reset button capabilities, and power and status LEDs. “Steve Ciarcia had a ‘Circuit Cellar.’ I have a ‘Design Dungeon,’” Steve Lubbers says about his Dayton, OH-based workspace. 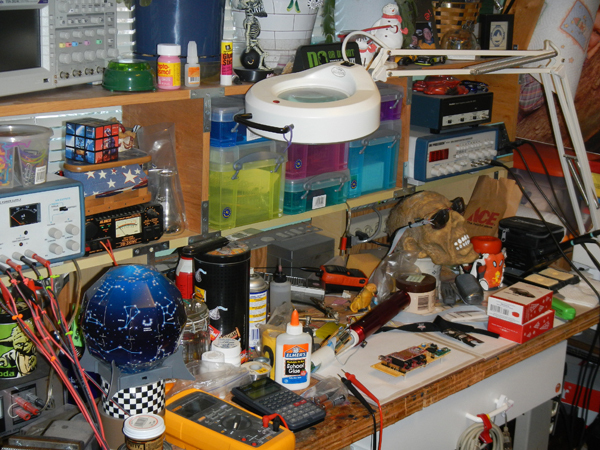 The workspace is a creative mess that has produced dozens of projects for Circuit Cellar contests. 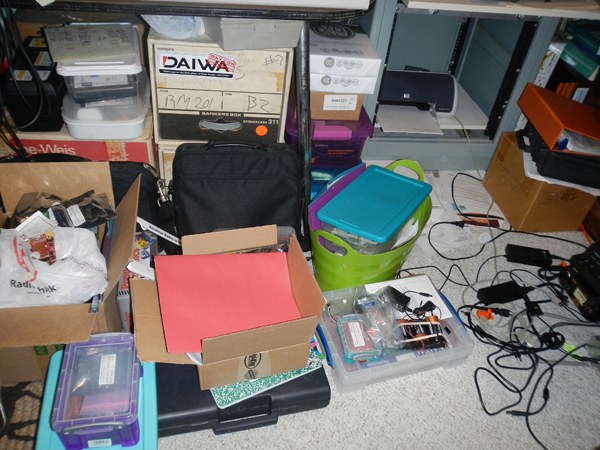 From the desk to the floor to the closet, the space is stocked with equipment and projects in various stages. The doorway is marked “The Dungeon.” The first iteration of The Dungeon was in my parents’ basement. When I bought a house, the workshop and the sign moved to my new home. The door is a requirement when company comes to visit. Once you step inside, you will see why. The organizational plan seems to be a pile for everything, and everything in a pile. Each new project seems to reduce the amount of available floor space. “High-tech computing” is accomplished on a PDP-11/23. 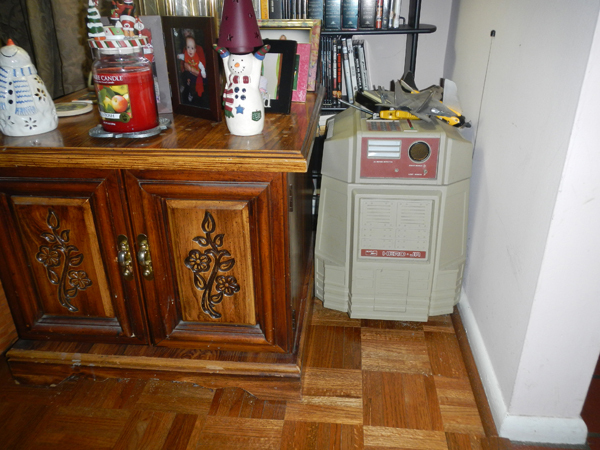 This boat anchor still runs to heat the room, but my iPod has more computing abilities! My nieces and nephews don’t really believe in 8” disks, but I have proof. The desk (messy of course) holds a laptop computer and a ham radio transceiver. Several of my Circuit Cellar projects have been related to amateur radio. A short list of my ham projects includes a CW keyer, an antenna controller, and a PSK-31 (digital communications) interface. Is there a desk under there? My workbench has a bit of clear space for my latest project and fragments of previous projects are in attendance. The skull in the back right is wearing the prototype for my Honorable Mention in the Texas Instruments Design Stellaris 2010 contest. It’s a hands-free USB mouse. The red tube was the fourth-place winner in the microMedic 2013 National Contest. Front and center is the prototype for my March 2014 Circuit Cellar article on robotics. Test equipment is a mix of old and new. Most of the newer equipment has been funded by past Circuit Cellar contests and articles. 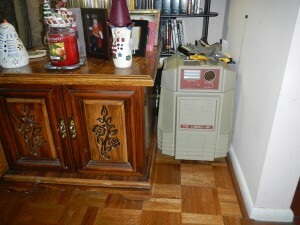 “My wife allows my Hero Jr. robot to visit the living room. He is housebroken after all,” Lubbers says. At one time, The Dungeon served as my home office. For about five years I had the ideal “down the hall” commute. A stocked lab helped justify my ability to work from home. When management pulled the plug on working remotely, the lab got put to work developing about a dozen projects for Circuit Cellar contests. 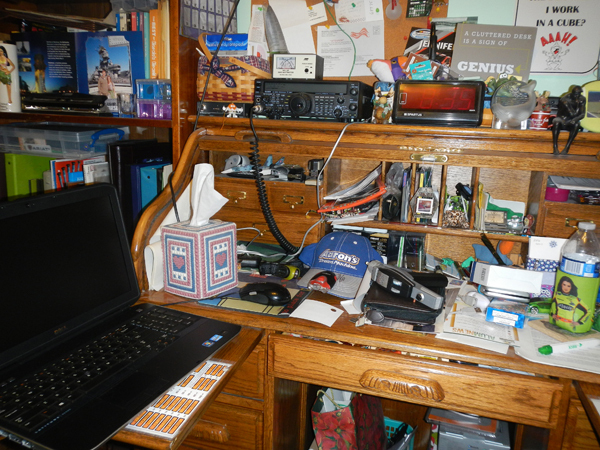 There has been a dry spell since my last contest entry, so these days I am helping develop the software for the ham radio Satellite FOX-1. My little “CubeSat” will operate as a ham radio transponder and a platform for university experiments when it launches in late 2014. Since I will probably never go to space myself, the next best thing is launching my code into orbit. It’s a good thing that FOX-1 is smaller than a basketball. If it was bigger, it might not fit on my workbench! 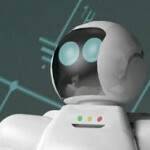 Lubbers’s article about building a swarm of robots will appear in Circuit Cellar’s March issue. To learn more about Lubbers, read our 2013 interview. 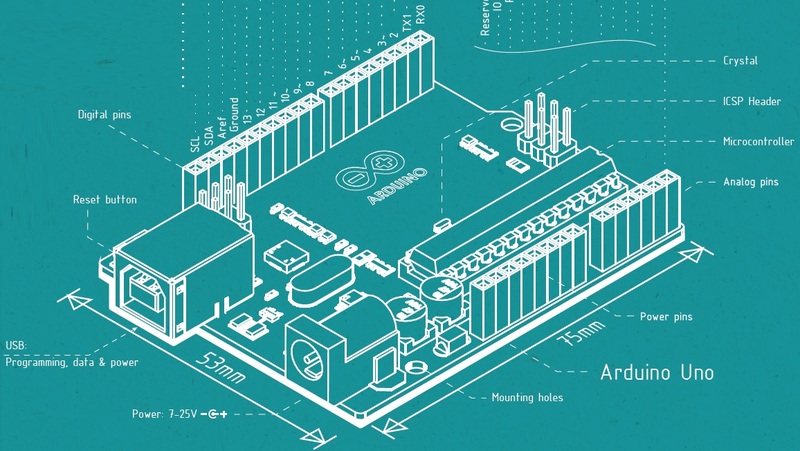 Arduino is an open-source development kit with a cult following. Open source means the software and hardware design files are available for free download. This begs the question of how the Arduino team can turn a profit, and the answer is the trademark and reputation of the Arduino name and symbol. While there are now many Arduino clones, the original Arduino boards still outperform most. Arduino is very useful for prototyping. A recent example in my own work is adding a gyroscope sensor to a project. First, I purchased a gyroscope board from Pololu for a small amount. I plugged it into an Arduino breadboard shield purchased from eBay for roughly $5, and wired up the four pins: VCC (3.3 V), GND, SCL, and SDA. Pololu’s website has a link to some demo firmware and I downloaded this from GitHub. The library folders were extracted and renamed according to the instructions and then the example was run. The Arduino serial monitor then showed the gyroscope data in real-time, and the entire process took no more than 30 minutes. Editor’s note: This EE Tip was written by Fergus Dixon of Sydney, Australia. Dixon runs Electronic System Design, a website set up to promote easy to use and inexpensive development kits. 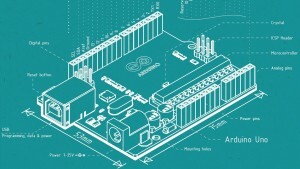 The Arduino Uno pictured above is a small portion of a full Arduino blueprint poster available for free download here. The G204 is a 3U CompactPCI Serial carrier card with an M-Module slot that combines fast CompactPCI Serial technology with flexible I/O options. The card serves as the basis for powerful 19″-based system solutions for transportation and industrial applications (e.g., data acquisition, process control, automation and vehicle control, robotics or instrumentation). M-Modules are modular I/O extensions for industrial computers (e.g., embedded systems and high-end workstations). The M-Module slot enables users to interchange more than 30 I/O functions within a system. The M-Module, which needs only one CompactPCI Serial slot, is screwed tightly onto the G204 and does not require a separately mounted transition panel. 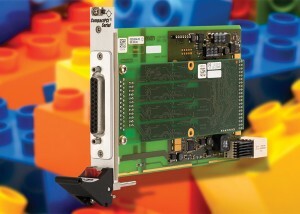 The G204 modular mezzanine card operates in a –40°C to 85°C extended temperature range for harsh environments and costs $483. The CorStarter-STM32 is a complete 32-bit ARM Cortex-M3 C development kit. It includes hardware and software to develop and debug C programs in a simple to use package. 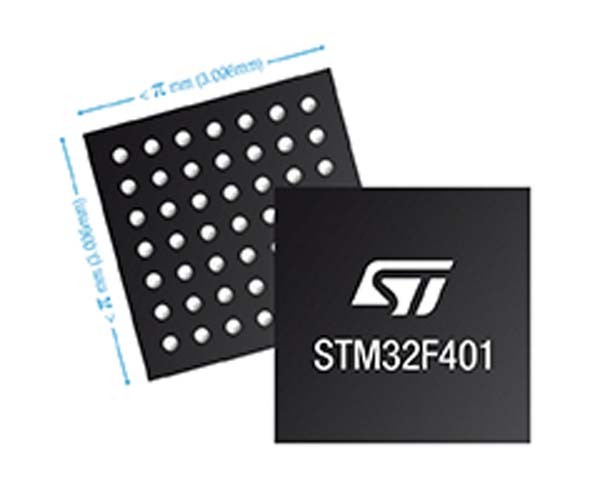 The CorStarter-STM32 base board is powered by a 72-MHz STM32 device with 256-KB flash and 64-KB SRAM. With 8-bit Arduino Shield-compatible headers, hundreds of Arduino Shields may be used to expand the system’s capabilities. Remaining I/O pins are brought out to the header, enabling access to full-power 32-bit embedded computing. 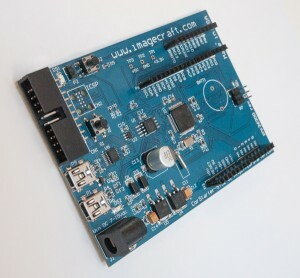 The CorStarter-STM32 base board includes open-source hardware design files. Fast code download and hardware debugging support are provided by either the industrial standard Segger JLINK-Edu or ST-LINK/V2. These JTAG/SWD pods enable full access to Cortex-M devices and seamless debugging without source code modification. To complement the hardware, the CorStarter-STM32 kit also includes an ImageCraft non-commercial C compiler (ICCV8 for Cortex) license. The C compiler includes a professional IDE with an integrated flash downloader and a source-level debugger. The compiler can also be used for other Cortex-M development projects. The kit also includes example projects and libraries for various Arduino Shields. The CorStarter-STM32 kit costs $99. The CorStarter-STM32 base board alone costs $55. 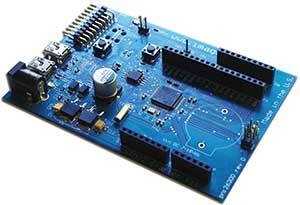 For educators teaching embedded system courses, the kit costs $1.